Many card games require only a player and deck of cards, but if you want to get money involved, you can play a variety of card games with quarters. These games rely on betting to make them more in-depth because the psychology of betting makes each game more than luck. Each game is easy to learn, and players can win a little money or just use quarters to play for fun. Guts is a Texas Hold 'Em variation that involves fast-paced hands and building prize pots. Each player places a quarter ante into the game, and then two cards are dealt to each player. Players choose whether to stay or fold. For the players who stay, the winning player gets the pot, and the losing players must match the amount in the pot. If no one calls, the winner collects the quarters, the deal is passed, and everyone pays the ante again. 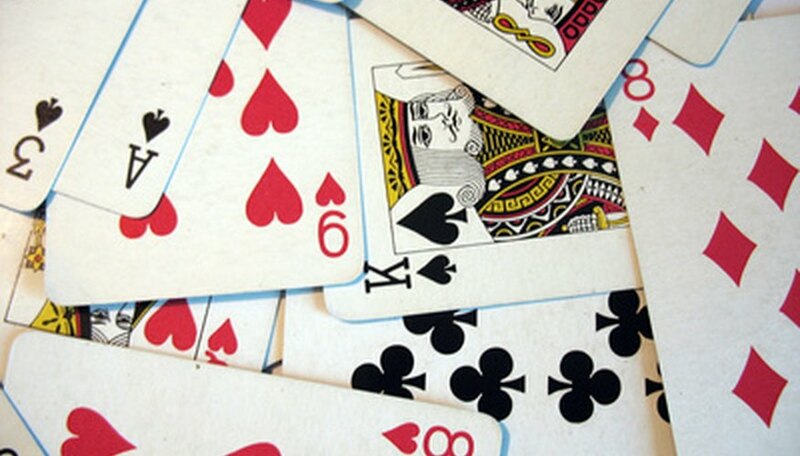 Players in Baduji use bluffing skills and luck to form four-card hands. The object of the game is to get a low four-carded hand with no matching suits. For example, a superior hand would be the ace of hearts, 2 of diamonds, 3 of clubs and 4 of spades. During each hand, players can re-draw for cards three times, with betting between each drawing round. Omaha poker is considered a four-carded Texas Hold 'Em game. Each player is dealt four cards and must use two of those own cards with three of the five community cards. Betting occurs after the hand is dealt, after the three-card flop, after the one-card turn and after the final card (the "river" card). The player with the best hand wins the pot. Razz is a betting game in which the lowest hand pays big. Each player is dealt three cards--one face-up and two face-down. Betting occurs after the deal, and then another card is dealt face-up. The process continues until each player has either folded or has six cards. After another round of betting, the final (seventh) card is dealt face-down, with one more round of betting. The player with the lowest five-card hand is declared the winner. The best possible hand is A-2-3-4-5, regardless of the suits. Add quarters to a game of War to make each flip of the card have a lot more at stake. Bet a quarter for each flip of the card. On each actual war situation (when each player turns up a matching number card or face card), players wager how many quarters they want to bet, and the winner of the war gets the cards and the quarters. The game ends when one player has all the quarters or all the cards.